By Susan Tretakis – Coral Springs, Fl – This is one of those times when I ask myself, “Why is this such a surprise?” I mean, it is not as if I haven’t interrogated, researched and ultimately written about the benefits of acupuncture for adults. It’s not as if I haven’t seen, with a clinician’s eye, the difference acupuncture can make in ADHD and autistic adults. It’s not as if I haven’t experienced the release of my own anxiety as well as the quieting of my inner voices after an acupuncture session. It’s not as if I had not experienced a full-blown emotional meltdown in my acupuncturist’s office and only found my breath again with his precise needling. It’s not as if I don’t know – both personally and for others – how acupuncture has eliminated digestive issues, headaches and even skin rashes. It’s not as if I haven’t heard from people how acupuncture has helped with sports injuries, sciatica, and migraine headaches. It’s not as if I haven’t heard from so many how acupuncture has helped them combat the side effects of chemotherapy and other drugs. It’s not as if I never heard someone say to me – or write to me – how much acupuncture has helped them feel emotionally stronger to face whatever the day may bring or how acupuncture gave them their best nights’ sleep. I mean, it’s not as if I didn’t know – didn’t I tell anyone who would sit still long enough to hear me out – about the decades of research showing acupuncture to have a number of health benefits for adults? I even cheered the 2018 media release by the FDA suggesting that doctors send patients for acupuncture before prescribing painkillers. I know all of this – and probably a lot more than most about the benefits of acupuncture; so why did I never think of what an incredible “gold-mine of healing” acupuncture could be for children? More and more parents are turning to acupuncture because it offers a safe, natural approach to pediatric care. By definition, acupuncture focuses on treating symptoms leading to a safe resolution of the illness. Just as in adult acupuncture, pediatric acupuncture helps to prevent future illnesses by stimulating healing and restoring the body’s own resilience. Modern pediatric acupuncture treatments are done using painless acupuncture and other, non-needle treatment techniques. And, truly, it makes so much sense that I am somewhat embarrassed that I did not see it before; children and teens suffer from anxiety and stress just like adults. Children and teenagers deal with issues of security and comfort and they have fewer tools to deal with their concerns and fears. It’s easy to follow the thread from anxiety and stress to sleep disorders, nightmares and difficulties in social situations. It’s even easier to see the connections from anxiety and stress to the manifestations of so many physical and emotional problems in children and teenagers. Medical journals and institutions agree that acupuncture’s use in both children and adolescents mirrors the technique’s rising popularity among adults. While the immediate thought is to think of acupuncture as a means to deal with pain, the Cleveland Clinic reports that acupuncture can help children and teens with a wide variety of issues, including, but definitely not limited to, sleep problems, anxiety, fatigue, headaches, reflux, nausea and stomach pain, bone and joint pain, ADHD, asthma and allergies, bedwetting and drooling. Traditional Chinese Medicine believes that each child – as is each adult – is unique. As such, pediatric acupuncture treatment plans are tailored to the child’s specific and individual needs. There are times when Western medicine may not successfully address the emotional and physical challenges faced by a child. I’m not a parent, but my heart broke last year when a friend described her daughter’s increasing social anxiety in middle school as well as her escalating digestive issues which led to even more embarrassment at school. When I asked what her pediatrician said, she quietly stated that he hoped her daughter “would grow out of it.” What parent can accept that statement and continue to watch their child suffer? The research from multiple studies on the efficacy of pediatric acupuncture abounds on the web. One of the latest studies, published in 2018, from the Harvard-affiliated Children’s Hospital in Boston, studied 253 youngsters for a one-year pain-management study with acupuncture. The study looked at children ranging in age from six months to 18 years of age. Complaints included stomach aches, headaches, back pain and other chronic complaints that caused frequent school absences. When the study began, the young patients rated their pain as an “8” on a scale of 1 to 10. When the yearlong study was over, the average pain rating among the study’s participants was a “3”. The children and teenagers reported they missed less school, were sleeping better and were more able to participate in extra-curricular activities as a result of treatment. In a 2013 study at another hospital, 70% of the 47 children and teenagers reported that acupuncture helped relieve their pain and 59% of their parents agreed. In this study, 15 children were age 12 and under while 32 were between 13 and 20 years old. The conditions for which these children were treated included migraines, endometriosis in teenage girls, and reflex sympathetic dystrophy (a syndrome in which chronic pain occurs after an injury). Other studies have reviewed acupuncture as a treatment for attention deficit hyperactivity disorders, cerebral palsy and autism in children and teens. The NIH estimates that about one third of the pediatric pain centers nationwide now offer acupuncture to their young patients. I know that my acupuncturist treats children as young as six months old. I had to ask the question that wasn’t being answered by any of my research: how do children react to needles? 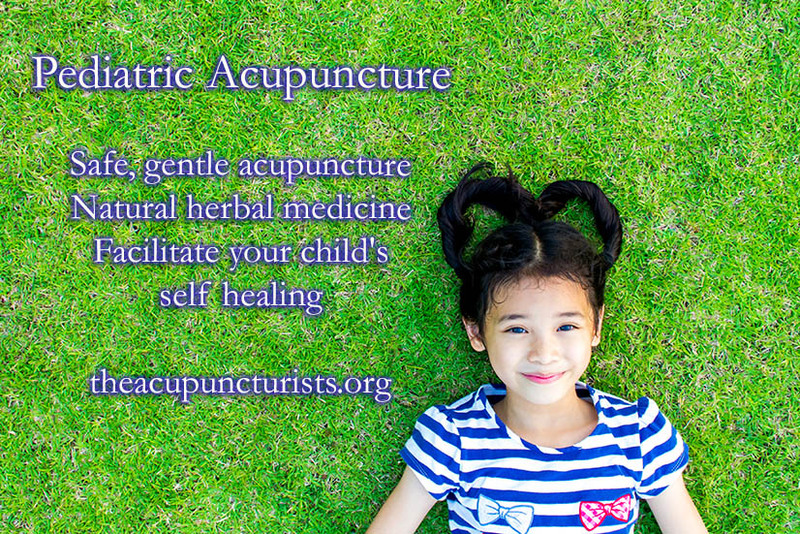 My acupuncturist explained that acupuncture for children is relatively painless. He demonstrates the needling on himself – which usually allays any fear in the child. As a pediatric acupuncturist, he is trained to use a special needling technique using needles so fine they are about the size of a strand of hair. For young children, he uses a rapid needling technique where the needle is inserted and immediately taken out. Babies are held – so they don’t roll over – and children do not have to sit or lie still for more than a few moments. Most though, in his experience, are willing to take the 20 or 30 minute “time out” from reality – something this much older acupuncture junkie can truly appreciate. My acupuncturist went on to say that disorders that are common to children, such as the common cold, cough, flu, allergies, asthma and digestive disorders are all treated successfully with acupuncture. Again, returning to the belief that all symptoms (illnesses) are from root causes, acupuncture can treat multiple symptoms in a single treatment just by which acupuncture point is selected. It’s important to remember that many TCM doctors are educators; my acupuncturist teaches his young patients about acupressure points. He can teach parents and care givers about dietary and other lifestyle modifications geared to their child’s illness and or complaints. In short, by taking into consideration all aspects of his young patient’s life, such as diet, digestion, sleep, energy and immune function, he simply does for the entire family what he has done for me, a much older infant/adolescent, these past three years. Acupuncture and Chinese Herbal Medicine can provide you and your whole family the opportunity to get healthy and stay healthy, naturally! After listening to him and compiling my notes to write this post, I began to connect some dots of my own. On a professional note, my psychological connection to acupuncture has grown even stronger. I remembered the many adolescents I had treated for mental health issues over the years. I thought of all of the battered men and women I treated for low self-esteem and polarizing anxiety. I wondered if I would have seen and heard such heartache from families if acupuncture was as easily attainable for them as it is today. I wondered about what tricks of TCM I could have shared with adolescents who were bullied, spouses who were mistreated. I wondered if the patients and friends I lost to drug overdoses could have found the strength to fight their battles, with more than just therapy. One’s ability to cope can so easily become undone in today’s social media world. Lauren Bacall is known to have said, “Growing old is not for sissies”. Neither is growing up today. My inner psychologist acknowledges that growing up today seems to become more difficult, more nuanced, more involved with each decade. On a personal note, researching and discussing pediatric acupuncture made me think of my own life. It became readily clear that many adults – like myself – have suffered from the incredible high and lows of depression and anxiety because acupuncture was simply not an option when I was growing up. By the time I hit my 20’s, my destructive life style behaviors were my only means of dealing with my emotional issues. By the time I hit my 30’s and 40’s, my relationship with food and alcohol were a series of love/hate/binge/purge episodes. My concept of “health” was skewed by my parents’ catastrophic illnesses and their early deaths. My sense of “balance” was constantly tipped by professional and personal betrayals. I am very lucky. By the time I hit my 60’s, the Universe had made sure that my acupuncturist had been born, raised to be both a compassionate and an inherently kind human being who went on to achieve professional accolades and become the caregiver – for all ages – he is today. 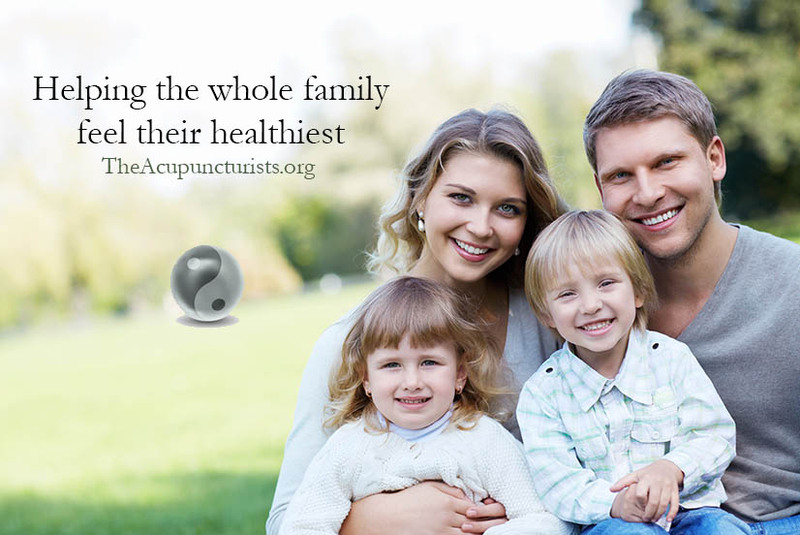 If you are interested to find out more about Pediatric Acupuncture and live in the area – Coral Springs, Margate, Coconut Creek, Parkland, Tamarac – take advantage of our free consultations with one of our licensed, experienced and trusted acupuncturists.